PanARMENIAN.Net - A new paper details how genetically modified pig hearts transplanted into baboons could support life and function for up to 195 days. The finding, published in the journal Nature on Wednesday, December 5 takes scientists a small step closer to the possibility of using donor animal organs for human patients in need of a heart transplant, CNN reports. "Consistent life-supporting function of xenografted hearts for up to 195 days is a milestone on the way to clinical cardiac xenotransplantation," the researchers wrote. 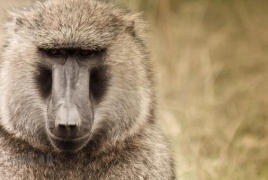 "Despite 25 years of extensive research, the maximum survival of a baboon after heart replacement with a porcine xenograft was only 57 days and this was achieved, to our knowledge, only once." Xenotransplantation refers to the process of transplanting organs or tissues between different species. The new study included only animals, and much more research needs to be done before the approach of using genetically modified pig hearts for human organ transplants could be explored. "Although the potential benefits are considerable, the use of xenotransplantation raises concerns regarding the potential infection of recipients with both recognized and unrecognized infectious agents and the possible subsequent transmission to their close contacts and into the general human population," the US Food and Drug Administration says. "Of public health concern is the potential for cross-species infection by retroviruses, which may be latent and lead to disease years after infection. Moreover, new infectious agents may not be readily identifiable with current techniques," according to the FDA. A heart transplant involves removing a damaged or diseased heart and replacing it with a healthy one from a donor who has died. The procedure is the only option for people with heart failure after all other treatments, such as medications or devices, have failed. Yet when the supply of human donor organs falls short of the clinical need for organs, patients are often left waiting. Limitations of the new study include that it remains unclear whether the approach could work in humans, but the findings take the scientific community one step closer to exploring the idea of transplantation in humans. The idea to use animal organs for transplantation has been discussed for decades but has never become a reality because the human body aggressively rejects animal organ transplants due to multiple and strong immune reactions, Barry Fuller, a professor in surgical science and low temperature medicine at the University College London, said in a written statement released by the Science Media Centre.